Food Hussy Recipe: CopyCat Maid Rites! (The Iowa Specialty!) | The Food Hussy! I tend to get obsessed about Iowa foods - I love big tenderloins, cheesy queso from "Mexican"-ish restaurants and MAID RITES - oh man - I almost forgot about Taco Johns Potato Oles! It's not that Ohio doesn't have amazing food - but Iowa is home - so I have a soft spot for all things Hawkeye. How to Make Maid Rites? The Maid Rite recipe is easy to make - you start with hamburger and add a bunch of seasonings to them and cook them down until the liquid has evaporated! All the ingredients are listed below! You'll love it! Now if you don't know what a Maid Rite is - think back to the days of Roseanne. Remember when she opened a diner and they served "loose meat sandwiches"? Well - there you go! It's like a sloppy joe without the sauce. Honestly - when I think back to eating Maid Rites as a kid - I really can't picture Neil Wicks (he ran the Maid Rite in my tiny town) putting all these ingredients in the sandwich. All I remember of him is him standing over the griddle with a big stogey hanging out of his mouth. Can you Make Maid Rites in the Crock Pot? Sure - to make your Maid Rite Recipes in the crock pot - just brown the ground beef first and then add all the seasonings and beef to the crock pot and put on low for a couple of hours. If you're serving them for a large group - you can just leave it on low for the party! What to serve with Maid Rites? Be sure to use the $1 buns - the cheaper, the better! Fresh, cheap & soft - that's the best way to go. Spoon a heap of the loose meat onto your cheap bun and you're ALMOST ready to go! Maid-Rites are an Iowa specialty that I've eaten since I was 3 years old. Brown ground beef & onion - chopping vigorously until the pieces are tiny! Add bouillon, water, brown sugar, apple cider vinegar, Worcestershire sauce and soy sauce. Stir and continue chopping ground beef. Simmer until liquid has evaporated. 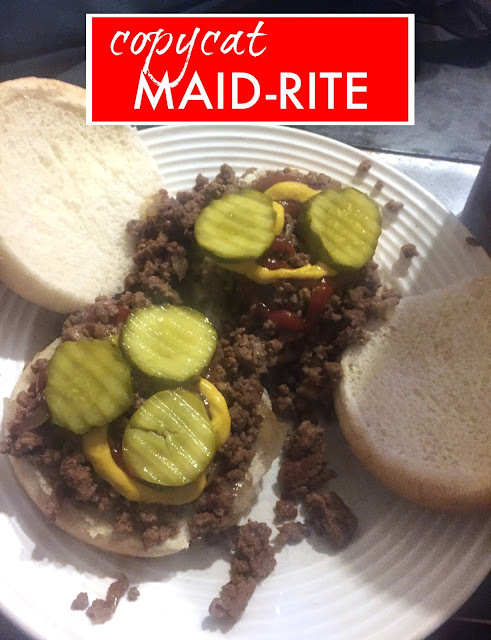 Top a heaping spoonful onto your cheapest hamburger bun and top with dill pickles, mustard and ketchup and you too will be reveling in the delight of the Iowa Maid Rite! OR Make it a Cheese-Rite by adding a slice of Land O'Lakes American Cheese - I heat it in the microwave to melt the cheese and soften the buns a little. Or stop at the Maid Rite in Greenville OH and load up. I've been there! Gum wall and all! Used to original Maid-Rite's these were not that good. Bland just loose hamburger.. Sorry you didn't love them - I think the seasonings, worcestershire and soy really add a bunch of flavor to the meat! Iowa Maid-Rites are an institution! I remember when the Maid-Rite in Lake Mills, IA burned down about 1969. I was pretty young, but remember a long period of mourning. They rebuilt and I was raised in that place. Your recipe looks great...I'm gonna try it. I make them now with beef broth and a little black strap molasses. I wrap each one in wax paper before I serve them to make it feel just like a real Maid-Rite. It's awesome! Yaaaaaas!!!! I love them! pickles, ketchup and cheese and it's Cheese-rite perfection! I wasn't expecting them to taste sweet. I followed your recipe to a T.
There's a little sweetness but not too much - hope you still liked them! I will be trying this recipe tonight, but thought I would let you know your beef will chop up finer and more easily if you add water to pan while browning it. In this case, I may try mixing the liquid ingredients from the recipe and adding it with the meat so it all cooks at the same time. I use water with the ground beef anytime I want it super fine....like taco meat to resemble taco bell texture.